Kalamazoo, MI August 31, 2017 – The Kalamazoo Symphony Orchestra, conducted by Resident Conductor/Interim Music Director, Daniel Brier, will open their 97th season with a program featuring Walker, Sibelius, and Tchaikovsky. Resident Conductor/Interim Music Director Daniel Brier states "Planning a season demands a lot of hard work! I'm very excited to open this season with these great masterpieces, our wonderful musicians, and our amazing guest artist, Jennifer Frautschi. After all the planning and preparation, I'm excited to finally see our 97th season take shape." The program begins with the Kalamazoo premiere of Pulitzer Prize winning composer, George Walker’s Sinfonia No. 4 “Strands”—the beginning of the orchestra’s initiative to perform twenty works by eight different black composers throughout the entire season. Two-time GRAMMY nominee and Avery Fisher career grant recipient Jennifer Frautschi appears this season as soloist with the Cincinnati Symphony Orchestra, performs a ‘reimagining’ of Vivaldi’s Four Seasons with Asheville Symphony, and gives two repeat performances of the James Stephenson’s Violin Concerto, a work she premiered with Minnesota Orchestra and Osmo Vänskä, at the Cabrillo Festival and Elgin Symphony. She will also perform with the Brevard, Des Moines, Elgin, Kalamazoo, Santa Barbara, and Wheeling Symphonies, as well as at the Seattle Chamber Music Society’s Winter Festival, Chanel’s Pygmalion Series in Tokyo, and the St. Barth’s Music Festival. Ms. Frautschi has appeared as soloist with Pierre Boulez and the Los Angeles Philharmonic, Christoph Eschenbach and the Chicago Symphony Orchestra at the Ravinia Festival, and at Wigmore Hall and Lincoln Center's Mostly Mozart Festival. As a chamber artist she has appeared at the Boston and Lincoln Center Chamber Music Societies; the Cape Cod, Charlottesville, Lake Champlain, La Musica (Sarasota), Moab, Newport, Ojai, Salt Bay, Santa Fe, Seattle, and Spoleto Chamber Music Festivals; Bravo! Vail, Chamber Music Northwest, La Jolla Summerfest, and Music@Menlo. Her discography includes the Stravinsky Violin Concerto with the Philharmonia Orchestra, and two GRAMMY-nominated recordings of Schoenberg's Concerto for String Quartet and Orchestra and the Schoenberg Third String Quartet. Recent releases include a recording of Romantic Horn Trios, with hornist Eric Ruske and pianist Stephen Prutsman, and the Stravinsky Duo Concertant with pianist Jeremy Denk. In the last two years, she has released two discs on Albany: the first devoted to the Schumann sonatas; the second an exploration of recent additions to the violin and piano repertoire by American composers. Ms. Frautschi performs on a 1722 Antonio Stradivarius violin known as the "ex-Cadiz," on generous loan from a private American foundation. 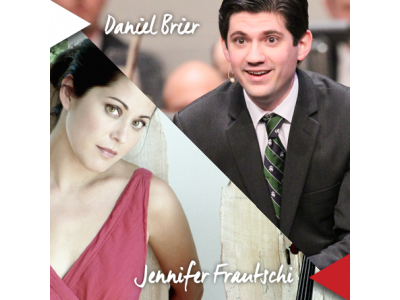 In the opening concert of their 2017-2018 season, world renowned violinist, Jennifer Frautschi, makes her Kalamazoo Symphony Orchestra debut in Sibelius’ dramatic and deeply romantic violin concerto under the baton of Resident Conductor, Daniel Brier. The program also includes a work by Pulitzer Prize winning composer George Walker and one of Tchaikovsky’s most-beloved masterworks, his 6th Symphony – the “Pathétique”.